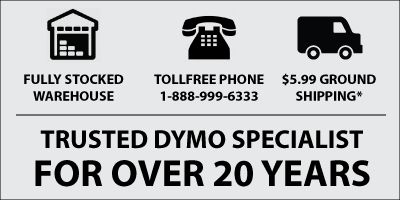 Dymo Rhino 18487 Metallic Permanent Polyester Labels 3/4"
Dymo Rhino 3/4" Permanent Polyester Label Cartridges / Tapes are compatible with almost all Rhino and RhinoPro industrial label makers ever made. Following is the complete list of compatible Rhino label printers. Dymo Rhino 18484 White Permanent Poly Label 3/4"
Dymo Rhino 18485 Metallic Permanent Polyester Labels 3/8"
Dymo Rhino 18486 Metallic Permanent Polyester Labels 1/2"
Dymo Rhino 18433 Yellow Vinyl Label 3/4"
Dymo Rhino 1805434 Metallic Permanent Polyester Labels 1"